Pomeranian may be small in size, but they are certainly not small in personality. Pomeranians are very lively and have big personalities. They are extroverted which makes them very sociable and vivacious. They are foxy, compact but highly active and very capable of entering agility competitions. Moreover, Pomeranians are very obedient and therefore, makes for a good family companion. Moreover, they are naturally alert and inquisitive which make them perfect for being watchdogs. Due to their size, Pomeranians are also perfect as city dogs. One way to take good care of them is to feed them the right food. In this article, I have rounded up 5 b﻿est dog food for Pomeranians. Anythings that comes from Blue Freedom has always been infused with all-natural and organic ingredients. The Blue Freedom Grain Free Puppy dog food is no different. Its main source of protein is chicken and not just chicken, but deboned chicken. It also contains numerous sources of complex carbohydrates such as sweet potatoes. More than this, this dog food comes with a perfect blend of antioxidants and vitamins. These nutrients are specifically processed at a relatively lower temp to ensure preservation. Moreover, this product contains glucosamine and chondroitin which promotes joint health. Another thing I loved about this is that it does not contain any grains or corn that may potentially trigger an allergic reaction from your Pom. 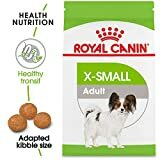 From the name and title itself, it is clear that this dry dog food is mainly designed and created for small dogs or small breeds like Pomeranians. The kibbles that it comes with are exceptionally tiny and are thus perfect for small dogs. Having small kibbles makes it easy for them to chew on and digest. Moving onto the nutrients, the Royal Canin X-Small dog food is formulated with essentials like EPA and DHA which promote the health of your dog’s hair and coat. It is no secret that Poms are highly active. For this reason, the Royal Canin is packed with a high amount of protein. It is infused with chicken meal and brewer’s rice among all others. The brewer’s rice is a good source of fiber which aids in digestion. 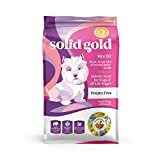 Just like the first dog food option in this list, the Solid Good Holistic dog food is also made and created for small dog breeds such as Pomeranian. This dog food contains a formula that specifically targets the needs of breeds like Poms. With this dog food, you will be getting a balanced amount of ingredients like brown rice which offer carbs and apples, cranberry, broccoli which contain vitamins and minerals. Overall, this dog food contains a perfect blend of twenty superfoods ensuring you that your Pom will get a very balanced diet. All these nutrients are packed in small kibble sizes which will make it easy for your Pom to chew and digest. The Organix Small Breed dog food utilizes organic and real chicken as its main protein source. In fact, besides organic chicken, it also features organic lentils, organic potatoes and even organic peas. All these are great sources of a variety of nutrients. As for the protein, this dog food product comes with 32% amount of protein ensuring you that your dog will get an enough amount to sustain his protein needs and promote the health of his muscled and overall body. Another thing I really like about this is that it also does not come with any grain which may potentially cause a trigger a reaction from your Pom. Another thing I loved about this is that the kibbles it comes with are just the right size. For this reason, I do not have to worry anymore about my dog choking on it. One of the features I really appreciated about this dog food is the formula it uses. This dog food’s sources of nutrients mainly comes from 85% animal ingredients, 15% vegetables and fruits. In fact, the manufactures of this organic dog food handpicks all the ingredients from local farmers ensuring you an all-natural content. The recipe it uses contains deboned protein sources. This include deboned turkey and deboned chicken.I guess if there was anything I quit did not like about this is it comes with a bit of a hefty price tag. However, if you can afford it, it can actually be worth it. Pomeranians or sometimes fondly called as Poms usually weigh around four to seven pounds. Usually, Poms’ weight do not exceed this size. As for their height, they usually stand no taller than eleven inches. According to a study done by the National Research Council of the National Academies, the recommended amount of dai﻿ly caloric intake for Poms should be around 300 - 400 kcal. This estimated amount ideally applies to an average Pom weighing around ten pounds. As for the Poms that have been otherwise spayed, neutered or older, they typically will need fewer amount of calories. However, do take note one of the most essential factors when identifying the necessary amount of calories one individual dog needs. This factor is the metabolism. Ultimately, it will still depend on their level of activity. For instance, a growing Pom puppy consumes more calories than adult Poms. Another example is if your young adult Pom which weighs around ten pounds as well is rather active and exercises a lot, then he or she will probably need around 430 kcal a day. Another instance is if your dog which also weighs around ten pounds is the opposite and pretty much lays around all day, then he or she will only need around 290 - 300 kcal a day. Just like human beings, protein is very essential in strengthening the muscles and bones of your dog. For this reason and more, it is crucial that your protein comes from organic sources. More than just organic, they must also be premium and of the greatest quality. As stated by the Association of American Feed Control Officials or also known AAFCO, the recommended daily amount of protein is about 22% of protein for ensured muscle growth for puppies. As for the adult dogs, you can lower down the daily recommended protein intake to around 18%. This is necessary for maintaining the health and well-being of your dogs especially their muscle health. Fats are very essential as a source of energy for dogs. Moreover, these essential fats are necessary to keep your dog’s coat very healthy. In fact, these fats can even add extra shine or glow to your dog’s hair. What makes fats very nutritious is because of the fatty acids they contain. To be specific, these are omega 3 fatty acids and omega 6 fatty acids. They help not just in the maintenance of your dog’s coat but also for your dog’s heart and brain. The recommended amount of fats for Pom puppies is about 8%. As for adults, you can lower it down to 5%. Of course, we can never forget the essence of vitamins and minerals. Pomeranians are very prone to certain conditions and some vitamins and minerals are equipped with the necessary nutrients to prevent this conditions from happening. For example, Pomeranians are susceptible to joint conditions. Vitamins and minerals like glucosamine and chondroitin are two very essential ones that can help maintain health of joints. To give you a bit of an idea, this is something similar to the health condition called slipped kneecap which can be common among humans. Typically, this happens when the dog is moving. The patella which can be found on the hind leg can slip and get moved away from its position. There are some instances in which the patella can move right back. But sometimes, it can lead to a chronic condition. This is, however, treatable. To be able to prevent this condition from happening, it is best that you maintain its join condition. Typically, puppies are more vulnerable and prone to this health condition. This usually happens when a puppy go too long without eating any meal. This causes their bodies to weaken instantly and their levels of blood sugar goes down immediately, as a result. Of course, to prevent this from happening you just need to at least provide extra small meals in between the bigger ones. The total count of meals a day should be about 3 - 4 every day for the first four months at least. Of course, once your dog gets past the young and puppy stage, it will be easier for him or her to regulate his blood sugar level. Once he or she is about six months old, you may proceed to transition to a diet plan which consists of feeding him or her around two meals a day. Whole meats are good sources of protein. These can vary from beef, lamb, fish and chicken. However, do take note that some dogs may be allergic to chicken. And now that we have talked about allergies, please also be wary of grains like corn. These are common fillers and may trigger an allergic reaction from your dogs. With all the factors mentioned above being considered, the best dog food for Pomeranian goes to BLUE Freedom Grain Free Puppy Dry Dog Food. First of all, this dog food comes with a protein rich formula. It mainly uses deboned chicken as its main source of protein. Moreover, this dog food comes with a perfect blend of vitamins and antioxidants of which all are processed at a low temp to ensure that the nutrients will be preserved. Moreover, this dog food comes with glucosamine and chondroitin which helps promote health of their joints. Moreover, it does not contain any grains, as well.